The escalating level of anxiety in our children begs for an explanation as well as a solution. Dr. Neufeld sheds light on this age-old problem, paving the way for natural interventions that can actually get to the root causes as opposed to just managing symptoms. This course brings a fresh and promising perspective to one of our most troubling and perplexing human problems. Although the focus is on children, this enlightening material will benefit anyone suffering from anxiety. The time has finally come to be able to answer the problem of anxiety. What makes it possible now is that we currently have enough pieces of the puzzle to create a coherent picture: a mastery of attachment theory, an understanding of human vulnerability, a working knowledge of attention, and the discoveries of neuroscience. Possessing the pieces are not enough however. It takes a theorist’s mind to put the pieces together and a seasoned therapist’s wisdom to test this model against human experience. Neufeld has been uniquely positioned, not only to answer this question but also to understand the implications for our children. The picture that emerges from his integrative synthesis resonates with current research as well as natural intuition. The resulting solutions are surprising, not in that they are counter intuitive but rather that they run counter to the prevailing practice. The focus of this course is the anxiety of our children and what we can do about this, both as a society and as the adults responsible for them. The dynamics and insights however apply to all ages. The instructional video serves as the ‘textbook’ for the course but this is only the part of the learning adventure. The course is delivered through our virtual campus with its rich resources and discussion forums. Participants will find much supplementary material available to enrich their experience. Study guides are also available to assist in digesting the material. The Anxiety Course can be taken individually or in groups. Support for groups can take a number of forms: live Q&A or supplementary seminar or interactive workshop. This support is usually delivered through our state of the art video conferencing system, but if feasible, can also be delivered on site. The Anxiety Course is also scheduled as an online course from time to time, allowing individuals from all over the world to come together as a group in real time to take the course. Please check SCHEDULED EVENTS for details. The course is divided into two parts: theory and application. The first three sessions are dedicated to unfolding a model of anxiety that has universal application. Given that anxiety is such an enigma, shedding light on its roots is absolutely essential to addressing the problem. Once the key insights are mastered, the implications and applications flow rather logically. The theory part of the course revolves around three conceptual keys that unlock the necessary insights. These keys come from three diverse scientific fields of knowledge: neurobiology, attachment and vulnerability. Only in bringing all these insights together does anxiety reveal its secrets. The focus of session one is the neuroscience of anxiety. The key discovery here is of a complex and comprehensive human alarm system. The anatomy of the alarm system is described along with how the alarm system is meant to work. When the pieces are put together, we find that there are three possible alternative outcomes to being alarmed. Before the alarm system can function optimally however, the child or adult must be capable of adaptive and integrative functioning. This functioning depends upon a well-developed and healthy limbic system and cerebral cortex. Deficits in this functioning can result in chronic and untempered alarm. The personality attributes associated with a healthy working alarm system are presented. To discover what alarms us, we need to go to the science of attachment and redefine our understanding of human threat - that of facing separation in all its various forms. A comprehensive understanding of attachment provides the insights required to make sense of what is happening on the neurobiological level. The third and final key to the puzzle however, it provided by vulnerability theory, as we realize that facing separation can be a vulnerability too much to bear. The resulting blindness cripples the alarm system and divorces the anxious symptoms from the underlying alarm. 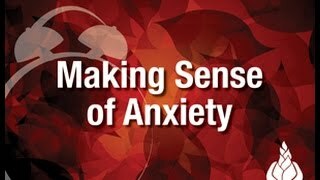 In this session, the insights are combined to create a working model of anxiety. The severity of defendedness gives rise to three kinds of alarm problems: anxiety-based, agitation-based, and adrenalin-based, with a whole spectrum of manifestations. The primary focus of this session however is understanding where obsessions and compulsions come from and outlining seven classical themes in our anxieties. Recognizing the signs of anxiety is key to addressing the underlying alarm. In preparation for the application part of the course, Dr. Neufeld outlines six reasons for the escalating anxiety of our children. In this final session, six surprising solutions are described for reducing the anxiety in our children. These solutions are not surprising once anxiety is understood, but they are surprising in that they run counter to most prevailing ways of dealing with anxiety. These solutions are also surprising in that they put parents in the drivers seat as the ultimate answer to childhood anxiety. What is also surprising is the profound effectiveness of these non-medical solutions, especially with children. Dr. Neufeld has been treating anxiety problems from this perspective for over forty years and in this session, describes the essence of this insight-based approach. The tuition fee for taking Making Sense of Anxiety is $125. This includes a virtual campus student pass of four months to access the videocourse material as well as other supporting materials. If a personal copy of the DVD set is desired, the tuition fee is $175.